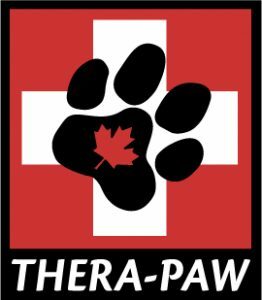 Therapaw.ca – When your pets need help, you have our support! When your pets need help, you have our support! 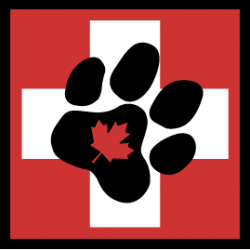 Thera-Paw Canada is committed to helping pets stay active and happy. Our products are designed to reduce pain, support injured limbs, and improve mobility. We are dedicated to finding the best support for your pet, whether it is one of our products, or from a different company. You can count on us to give you the best advice for your pet or pet owner. Jen received her Masters of Science in Physical Therapy from the University of Alberta in 2009. She works as a physiotherapist and hand therapist in Nelson, BC. 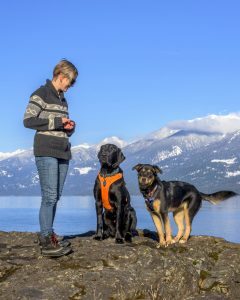 Motivated by her commitment to the care of animals she has continued her education to be able to apply her physiotherapy skills toward animals and started Kootenay Canine Rehabilitation in 2011. Jen has completed her Diploma in Canine Rehabilitation and continues to pursue advanced education in animal rehabilitation. In January of 2017, she took a canine bracing course, offered through the Animal Rehabilitation Division and fell in love with the work. She then completed intensive training with Ilaria Borghese (founder and president of Thera-Paw, Inc.) before starting Thera-Paw Canada. In her spare time, Jen enjoys hiking with her family, trail running with her dogs, snowboarding and is constantly finding new ways to be creative through cooking, baking, knitting or sewing. We all know dogs come in many shapes and sizes. As such, these boots can be customized for optimal fit. 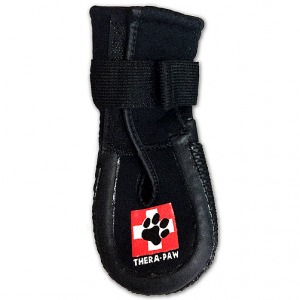 Thera-Paw Boot should fit snugly on the paw, and around the wrist or ankle. Top cuff of the boot should sit below the joint (bend) of the wrist or ankle. ​NOTE: Not recommended for pets that knuckle or drag their paws. 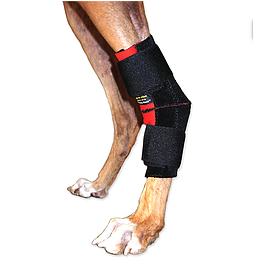 Custom Carpal Supports are designed for the pet’s specific needs. These braces can be lightweight and flexible or completely immobilizing. Braces are versatile and stability can be decreased/increased depending on the pet’s needs. 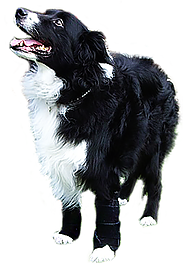 Custom tarsal supports are designed for a dog’s special needs. These supports can be lightweight and mobile, or completely immobilizing. The supports are versatile and stability can be increased or decreased depending on the pet’s needs. 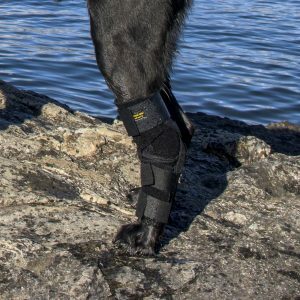 For dogs with Achilles tendon injuries or those collapsing into flexion, “extension-assistive straps” are added to custom tarsal braces. The straps are sewn onto the proximal caudal aspect of the brace; they crisscross above the calcaneus and then you affix them distally via Velcro tabs to regulate the amount of assistance needed to maintain extension. 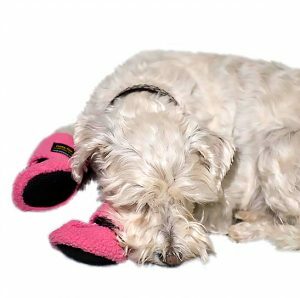 Custom tarsal braces can be made for small pets. 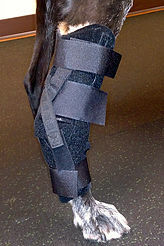 Above is an example of heavy-duty bilateral tarsal braces, lined with shearling (thin sheepskin) that are just about 3″ tall. 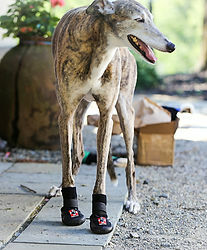 Lightweight, more streamlined versions of these can be made for pets that require only minimal support. 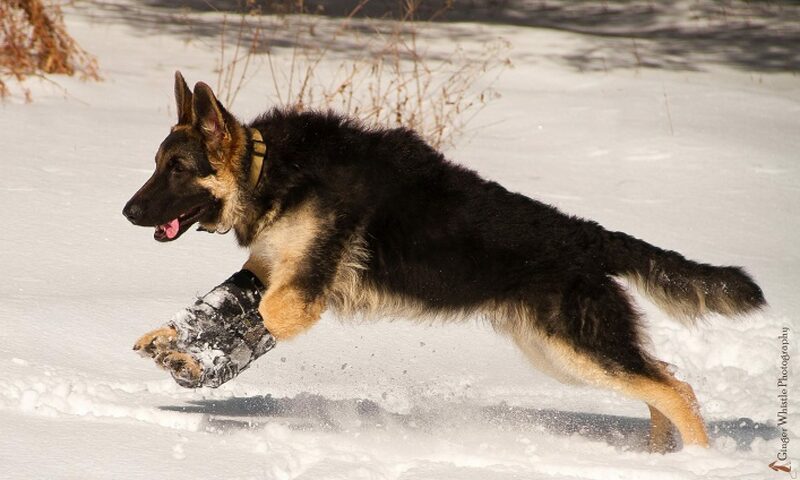 For pets with significant stability impairments that require the carpus to be completely immobilized. Tarsal and Carpal kits are available. 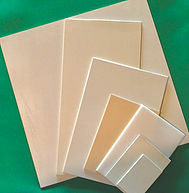 Our splinting kits use VetForm Thermoplastic sheets. 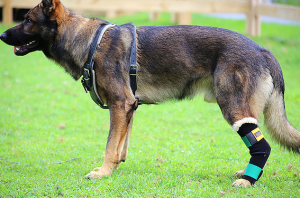 VetForm is a type of thermoplastic developed specifically for Thera-Paw and takes the guess work out of choosing the right thermoplastic material for splinting. It is easy to work with and provides strength. To ensure the health and safety of the pet, our line of custom products can only be ordered by a veterinarian or animal rehabilitation specialist. 1. Please fill out the Veterinary Request Form and give it to your veterinary professional. 2. Ask your veterinary professional to contact us directly to determine the best product for your pet’s specific needs. 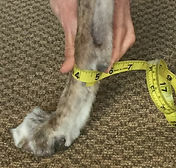 STEP 1: Measure the width & length of paw. 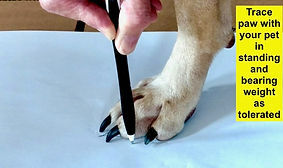 Place a piece of paper on the floor and trace the outline of the paw, from the longest nail to the very back of the paw pad. Hold your pen at a 90 degree angle to get the most accurate tracing. Then record the length and width of the paw. STEP 2: Measure the paw circumference. 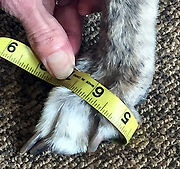 Use a measuring tape or piece of string to measure the widest part of the paw. This is best done in standing, but if you are unable to get a standing measurement, please indicate the measurement was taken in non-weight bearing when sending measurements to us.. STEP 3: Measure the wrist (A) or ankle (B) circumference. 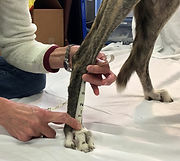 Use a measuring tape or piece of string to measure the widest part of the wrist (front leg – A) or ankle (back leg – B). STEP 4: Part A (for front paws only) Measure the wrist height. 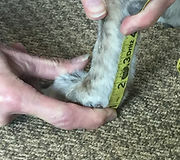 Measure the distance from the floor behind the pet’s paw to just below th e carpal pad (carpal pad located behind the leg at the level of the wrist joint). 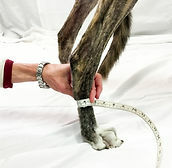 ​Measure the distance in front of the leg from the top of the paw to just below the ankle joint.